The Vaunn Medical hi-performance white tubing for the CPAP/BiPAP machine is lightweight, flexible, and preferred by CPAP users for the relief of the tugging, pulling, and tangling experienced with standard CPAP tubing. It is 20% lighter than standard tubing and many times more flexible, making it the perfect choice for smaller, lightweight masks that have easily disturbed seals. Ergonomic design cuff provides a secure seal and is easy to grasp and remove from mask/machine. 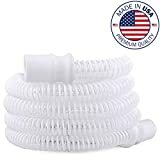 With the introduction of minimalist, ultra-light CPAP masks, it is more important ever to reduce the dragging and pulling that can be caused by traditional, heavy CPAP hoses and tubing. The Vaunn Medical ultra-light white Hi-Performance Tubing is 20% lighter and much more flexible than standard tubing, providing a more forgiving connection to the device so it is less likely to pull the interface and disrupt the seal. Performance Tubing is pure white in color so it looks less clinical (and ugly) than standard gray CPAP tubing. It includes ergonomically designed end caps that are easy to grasp and remove. The Vaunn Medical CPAP Tubing is compatible with all major CPAP/BiPAP machines due to its universal ergonomic cuffs that provides a secure fit on any machines that uses a standard CPAP tubing. This includes machines from ResMed, Fisher & Paykel, DeVilbiss Healthcare, Human Design Medical, Somnetics, Puritan Bennett, Covidien and more! Our CPAP tubing is proudly made in USA and has undergone stringent product testing and evaluation over the years. We are confident that our tubings are of superior quality when compared to even the most well-known brands in the market that tends to manufacture their tubing in China. We have received feedbacks from customers that have previously bought and received some generic non Vaunn Medical tubing. Please note that these are imitation. Do not purchase from these sellers. Beyond Med Shop is the sole authorized distributor for the Vaunn Medical performance tubing. 100% satisfaction guaranteed.